A string of arrests and a deportation have sent a group of Cambodian environmental activists looking for cover. A Cambodian activist group campaigning against sand mining in the country’s coastal estuaries has employed a surprising new public face for its latest campaign: a puppet. Mother Nature Cambodia has made powerful foes while exposing links between government officials and a black market sand mining industry worth hundreds of millions of dollars. Five members of the activist organization have been jailed; the leader was deported; and two of the founders claim they were strong-armed into removing Mother Nature from Cambodia’s registry of nongovernmental organizations. Central to Mother Nature’s strategy are short video clips hosted by activists, usually at the scene of an alleged environmental crime, and disseminated through social media. In September 2017, the group released a video asking the government to explain why US $32-million worth of silica sand imported by Taiwan was missing from official Cambodian export data. The clip became the group’s most popular to date, with more than 1.6 million views. Two days after its release, the two men who produced and feature in the film—Hun Vannak and Doem Kundy—were arrested while in the field working on a follow-up episode. In January, Vannak and Kundy were charged with incitement and breach of privacy, and handed one-year prison sentences. In a statement, Amnesty International said the verdict was “a farcical sentence that must be overturned immediately.” Local human rights group LICADHO added the pair to its list of Cambodia’s political prisoners. “There is an obvious pattern” to the arrests, says Alex Gonzalez-Davidson, the Spanish cofounder of the group who was expelled from Cambodia in 2015 after successfully campaigning against construction of a hydropower dam. The short films were putting hidden crimes on the national agenda, but they were also making targets of the activists. So, Mother Nature’s first video of 2018—asking the government to explain why a mangrove forest inside a coastal wildlife sanctuary is being developed—was hosted by a puppet. The bespectacled puppet in a casual shirt helps the activists get their message out, without having to get in front of the camera. Vannak says he and his fellow activists can’t trust the legal system. “The law can be manipulated to suit powerful people,” he says. One Mother Nature activist who agreed to speak on the condition that he remain anonymous says when he joined the cause, he risked being outcast from his family: his uncle is a high-level state administrator and a staunch supporter of the ruling party. Without the public profile of other campaigners, the anonymous activist is able to move more freely around the country, collecting information and imagery for the videos. But the organization’s move to operate under the guise of a puppet is less about fear, he says, and more about keeping members out of prison and the movement alive. Matt Blomberg is an Australian investigative journalist who has written extensively about human trafficking and maritime crime. 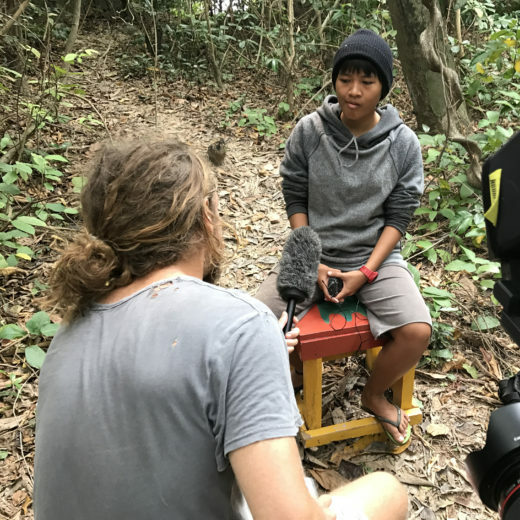 He splits his time between Cambodia and Vietnam, and is making a documentary film about illegal, unreported, and unregulated fishing, violence at sea, and corruption. Blomberg likes chasing stories where he can get himself and his equipment dirty. Cite this Article: Matt Blomberg “Cambodian Activists Find Security in Puppets,” Hakai Magazine, Apr 12, 2018, accessed April 23rd, 2019, https://www.hakaimagazine.com/news/cambodian-activists-find-security-in-puppets/. Three activists are living in exile following a campaign to expose Cambodia’s sand mining industry.